Remarkable breakthroughs in science throughout history are inherently linked to advances in the study of light-matter interactions. For the past two decades we have witnessed major advances in nano-optics and ultrafast physics, allowing for the exploration of phenomena in higher spatial and temporal resolution than ever before. The research in our lab aims to merge these extreme resolution capabilities of space and time in order to provide a window into spatio-temporal ultrafast dynamics at the nanoscale. In particular, we are interested in exploring the ultrafast hot electron dynamics and related nonlinear effects in plasmonic nano-structures and metamaterials. Our current goal is to understand the effect of the nanoparticle’s geometry and environment on the spatio-temporal hot electron evolution and its relation to nonlinear optical generation. Our research is driven by the attempt to combine theoretical microscopic models with novel experimental measurement methods, which include: pulse-shaping based measurements, ultrafast pump-probe spectroscopy, ultrashort light sources and near field microscopy. We are also interested in exploring geometric quantum coherent control schemes. The approach, which is based on continuous (Lie) group theory, provides a route for determination whether a quantum system is controllable, not controllable or sub-controllable. 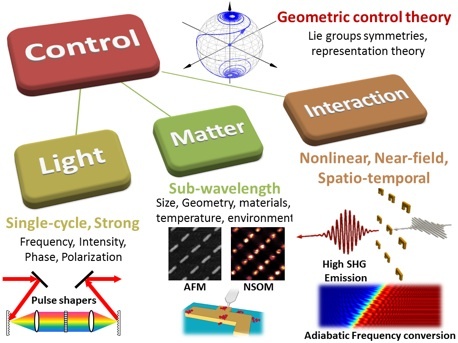 Such methods have been harnessed in recent years to study control in many quantum and classical systems, such as nuclear magnetic resonance, optical spectroscopy, coherent control, solid state physics and frequency conversion. •M. Mrejen*, L. Yadgarov, A. Levanon, H. Suchowski*, "Exciton-polariton dynamics in WSe2 by ultrafast near-field imaging", arxiv1711.07037, accepted Science Advances (Dec. 2018). •I. Malkiel*, M. Mrejen, A. Nagler, U. Arieli, L. Wolf, H. Suchowski*, "Plasmonic nanostructure design and characterization via Deep Learning", Light: Science & Applications 7, 60 (2018). •A. Padan*, H. Suchowski*, “A quantum retrograde canon: complete population inversion in n2-state systems”, New J. Phys. 20 043021 (2018). •H. Greener*, H. Suchowski*, “Composite Pulses in N-level Systems with SU(2) Symmetry and their Geometrical Representation on the Majorana Sphere”, Journal of Chem. Phys., 148, 074101 (2018). •A. Levanon*, A. Dahan, A. Nagler, E. Lifshitz, E. Bahar, M. Mrejen, H. Suchowski*, “Pulse shaping of broadband adiabatic SHG from a Ti-sapphire oscillator”, Optics Letters 42, 2992-2995 (2017). •M. Mrejen*, H. Suchowski*, T. Hatakeyama, C. Wu, L. Feng, K. OBrien, Y. Wang, X. Zhang, “Adiabatic elimination based coupling control in densely packed subwavelength waveguides”, Nat. Comm. 6, 7565 (2015). •K. O’Brien*, H. Suchowski*, J. Rho, B. Kante, A. Salandrino, X. Yin, X. Zhang, “Predicting nonlinear properties of metamaterials from the linear response”, Nat. Materials 14, 379 (2015). •H. Suchowski*, G. Porat*, A. Arie, “Adiabatic processes in frequency conversion”, Laser and Phot. Rev. 8, 333 (2014). •E. Svetitsky*, H. Suchowski*, R. Resh, Y. Shalibo, J. M. Martinis, N. Katz, “Hidden two-qubit dynamics of a four-level Josephson circuit”, Nat. Comm. 5, 5617 (2014). •H. Suchowski*, K. O’Brien*, Z. J. Wong*, A. Salandrino, X. Yin, X. Zhang, “Phase-mismatch free nonlinear propagation in zero-index optical materials”, Science 342, 1223 (2013). •H. Suchowski, P. R. Krogen, S. W. Huang, F. X. Kärtner, J. Moses, “Octave-spanning coherent mid-IR pulses via adiabatic difference frequency generation”, Opt. Exp. 21, 28892 (2013). Near field microscopy, coherent control, Ultrashort physics. •PhD candidates, who wish to to gain scientific knowledge in both ultrafast physics and nano-photonics, and would like to be part of our effort to develop a one-of-a-kind measurement capability with 20fs-15nm spatio-temporal resolution, are welcome to contact Dr. Haim Suchowski.